If you’re committed to achieving the best results from your workouts, knowing the best BCAA supplements is essential. Resistance training produces rewards. But you want to gain even more lean muscle mass, improve performance and boost recovery in the most time-efficient manner possible. I know you’re in agreement. BCAAs can achieve all these goals. And that isn’t hype. Numerous studies have shown this to be fact. This article will explain the science behind BCAA supplements. In addition, based on extensive research, it will outline the best BCAA supplements available today. As I have illustrated, BCAAs are essential for the bodybuilder and fitness enthusiast. However, trying to ensure that these important amino acids are delivered through food is extrem16ely difficult. Firstly, it means a serious commitment to a diet heavin in BCAA foods. Secondly, leucine, the most important of the BCAAs, is lacking in many foods, especially those that are plant based. This can make it difficult if you follow a vegetarian or vegan diet. The best way to ensure you receive enough BCAAs for visible results is to supplement. Through intense research, I have found the best BCAA supplements available today. Both designed and approved by SAS professionals, this BCAA powder supplement is probably the most powerful BCAA supplement available today. That’s why it’s at the top of this best BCAA review. But why is it the most powerful? It has been formulated with science in mind. The manufacturers have identified one predominant factor in BCAA supplementation—that leucine is the most important of all the BCAAs. As already discussed, this is the BCAA which initializes muscle protein synthesis. More leucine means more muscle mass growth. This supplement, therefore, has BCAAs in the ratio of 4:1:1— four parts leucine to one of both valine and isoleucine. It’s a powerful combination, providing the perfect balance of BCAAs and promoting important muscle growth. Most other supplements available are either 1:1:1 or 2:1:1. Still beneficial, but failing to provide enough leucine to give the most effective results. Furthermore, this is all the supplement contains. There are no fillers or ineffective ingredients. This has to be the best BCAA 2019. 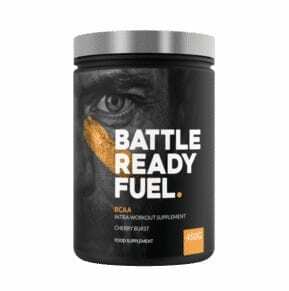 Battle Ready Fuel BCAA can only be purchased from the official website. Contains an impressive ratio of 4:1:1—leucine being in the largest dosage. Will promote fast muscle growth. Ingredients backed through scientific studies. Comes in convenient cherry-flavored powder. One of the best BCAA supplements I have seen. Designed mainly to assist with workout recovery and muscle repair, this supplement has two extra ingredients on top of BCAAs. These properties could make it more appealing to the endurance athlete instead of the bodybuilder. The 2:1:1 ratio would still provide muscle gains, although not as powerfully as Battle Ready Fuel BCAA. This supplement is only available from the official Transparent Labs website. Available in five different powder flavors. Includes glutamine to boost muscle repair. Contains coconut water powder for immune system health. Has a 2:1:1 BCAA ratio. A sugar and carbohydrate free BCAA powder, from respected nutrition supplement providers, Scivation. It’s free from calories and therefore may appeal to people looking to lose weight. This supplement can be purchased from the official Scivation website, Amazon and Walmart. Includes citrulline malate to boost nitric oxide production. Contains glutamine for enhanced recovery. A ratio of 2:1:1 for BCAA content. Many people find the powder “gritty”. Optimum Nutrition’s Gold Standard BCAA is formulated to increase muscle mass through its essential amino acid ingredients, while raising endurance levels. It contains 15 calories per serving and has been tested for banned substances—ideal if you are using it during competition. This BCAA supplement can be purchased from the official Optimum Nutrition website, Amazon and the BCAA GNC Gold Standard page. Includes scientifically studied ingredients of Rhodiola and Baker’s yeast. BCAA in the ratio of 2:1:1. Only 28 servings per tub. EVLution Nutrition’s BCAA complex brings things back to basics. Like Battle Ready Fuel’s supplement, this contains no other ingredients, apart from the all-important BCAAs. However, the ratio is where they differ. This supplement has a less potent 2:1:1 proportion, meaning it did not appear as the best BCAA on this list. This supplement is available in nine flavors, with each tub providing 30 individual servings. It contains no sugar and zero calories. It does, however, contain gelatin, which makes it unsuitable for vegans. Although not number one, it’s still one of the best BCAA supplements. You can obtain this supplement from the EVLution Nutrition website, Amazon and Walmart. No fillers—a pure BCAA supplement. Can be purchased from numerous outlets. Contains zero calories and no sugar. Ratio of 2:1:1—not as powerful as Battle Ready Fuel. Doesn’t dissolve as easily as some other powders. MusclePharm’s supplement offers an alternative take on BCAAs. Instead of the commonly found 2:1:1 ratio, this supplement has 3:1:2. This equates to three parts leucine to one isoleucine and two valine. A ratio such as this would indicate it’s aimed more at performance and maintaining muscle, rather than building mass. However, there are no studies to indicate increasing valine to this level would have any more beneficial effect than in a 2:1:1 ratio. There are four different flavors to choose from, plus one “unflavored”, which is useful if you would prefer to add to your own favorite drink. It also includes the artificial sweetener, sucrose. Both the official MusclePharm website and Amazon retail this supplement. Has higher valine content than most supplements. Available in an unflavored version. Lacking in evidence that higher valine content improves performance. This Dymatize supplement is the only one in this list that isn’t a powder. Hence, these may appeal to those who neither like the taste or texture of supplement drinks. Probably the best BCAA capsules available. Gluten free, this supplement provides BCAAs in a 2:1:1 ratio. As one tablet cannot hold the same quantity of ingredients as a powder, this supplement needs to be taken four times per day. Dymatize BCAA is available from the official website and Amazon. Tablet form may appeal to people who do not like powders. Includes additional B-vitamins and calcium. Must be taken four times per day. Firstly, I want to speak briefly about amino acids—it’s important to fully understand the BCAA definition. Many of these amino acids can be synthesized by the body—it can produce them itself. However, there are some the body requires that cannot be synthesized. These are termed “essential amino acids.” The only way for them to enter the body is through ingestion, usually from food. Each of these BCAAs has its own particular effect. This BCAA has two important functions that are crucial if you’re looking to build muscle mass. Secondly, during training, valine helps to supply muscles with additional glucose for energy. The excess ensures muscles are not used as energy stores, which helps to retain mass. The most important BCAA for the serious bodybuilder. As I’m sure you are aware, protein is essential for building muscle—just like a car requires gasoline to run. However, just filling your gas tank doesn’t make your car power down the road. You have to switch it on. That’s exactly what leucine does. The best BCAA supplements will have leucine in a higher concentration than the other two BCAAs. This amino is perfect for bodybuilders who are looking to recover faster after intense and prolonged workout sessions. Many of these individual characteristics cross over between the three amino acids—to a greater or lesser extent. Combining them together provides the best results from one supplement. What Are the Benefits of BCAA’s? It’s often a misnomer that BCAAs are for the sole use of the bodybuilder. Let me tell you, this is incorrect. BCAAs are, indeed, one of the most important supplements a bodybuilder can take. However, they are also ideal for athletes, sportspersons and the general home-fitness enthusiast. The benefits you receive from the best BCAA supplements depend on the work you put in. While they can help to build sizeable muscle mass, they still need to be combined with resistance exercise. If you don’t lift weights, but instead compete in cycling, for example, they will help to retain lean muscle, assist with weight loss and improve aerobic capacity. BCAAs respond to the work you put in, and give you the rewards you seek. Here are the main BCAAs benefits. Reduces recovery time, post exercise. Promotes energy from glucose as opposed to burning muscle. Builds large muscle in combination with resistance exercise. Boosts human growth hormone (HGH) levels. Eliminates or reduces DOMS (delayed onset muscle soreness). The ideal BCAA dosage depends on your requirements and what you are trying to achieve. As a rule of thumb, the maximum dosage per day should be around 12 grams of BCAAs for women and 20 grams for men. Both of these limits are for people wanting to gain muscle mass through resistance training. If however, you are looking to use BCAAs to help with weight loss or find the best BCAA for cutting—six grams per day is the ideal amount. That applies to both men and women. But, what BCAA ratio is best? For bodybuilding, the highest leucine content possible is the ratio you should focus on. Currently, the most potent one on the market is 4:1:1 by Battle Ready Fuel. For weight loss, 2:1:1 will suffice, although there is no harm in taking a higher leucine content. If you aren’t training hard, you won’t put on muscle anyway. BCAAs are one of the most natural, effective and scientifically proven ways to boost muscle growth, increase endurance, improve recovery and drop unwanted weight. All the above supplements have their own particular benefits. But, which brand of BCAA is best? The stand out product has to be Battle Ready Fuel BCAA. With its unrivaled 4:1:1: ratio, that is, the best BCAA ratio, this potent leucine supplement can dramatically improve training results—in a short time. Hence, if you want to make significant gains, with undoubtedly one of the best BCAA supplements available, head over to the official Battle Ready Fuel website today. Yes. BCAAs can assist weight loss in two main ways. Firstly, proteins stimulate the production of cholecystokinin—the hormone which “switches off” hunger. What’s the Best Amino Acid in BCAA? Theoretically, there is no “best” amino acid, as it depends on the results you are trying to achieve. However,if you are looking to gain muscle mass, leucine is the most important. This is because this BCAA is responsible for “switching-on” the process of muscle protein synthesis which, in turn, promotes muscle growth. BCAAs are essential for virtually every aspect of bodybuilding. They boost muscle growth, enhance performance, promote weight loss, improve recovery time and reduce fatigue. Does BCAA Give You Energy? How Much BCAA Should a Man Take per Day? If undergoing resistance training, 15 grams per day is ideal for gaining significant muscle mass. Six grams will suffice if looking to lose weight. How Much BCAA Should a Woman Take per Day? 10 grams per day taken alongside resistance training will yield impressive results. The best BCAA for weight loss dosage is around four to six grams per day. When Should You Take BCAA’s? BCAA levels are at their highest around 30 minutes after consumption. So look to take them about this time before your workout. When to take BCAAs on non-gym days? Usually in the morning, as this can help recovery and boost muscle growth. What is Better BCAA Capsules or BCAA Powder? BCAA powder is definitely better than capsules because some people have a hard time swallowing capsules or might have allergy to gelatin which capsules are made of. Is BCAA Better Before or After Workout? Muscle building takes place post-workout, so there is some debate as to whether consuming BCAAs before a gym session has any more beneficial effects than taken after. How Many Times Should You Take BCAA a Day? Try to take BCAAs before your workout to reduce DOMS. However, if you wish to spread your daily dosage throughout the day, this may be more convenient and will not adversely affect muscle growth. What BCAA Ratio Is Best? As leucine is the most powerful of all the BCAAs, this should always have the largest content. The most potent ratio has been agreed as 4:1:1—four parts leucine together with one part each of valine and isoleucine. Not exactly. Proteins contain amino acids, which may include the BCAAs of leucine, isoleucine, and valine. However, don’t automatically assume that the protein powder you are taking includes these, or in sufficient amounts to be effective. Can BCAA Cause Hair Loss? No. Because of the anabolic effect of BCAAs, this belief has gathered some momentum, based on the similar effects of testosterone. Which Brand of BCAA Is the Best? What is the best BCAA on the market? It’s Battle Ready Fuel BCAA. This is due to its high BCAA dosage, combined with the ideal ratio of 4:1:1.